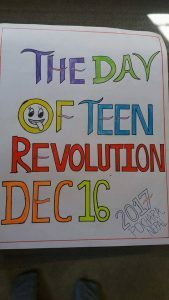 Every year, December 16 marks the Day of Teen Revolution in the world believing in the power of teenagers to create a revolution. 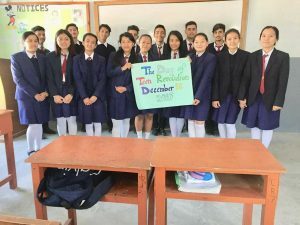 This year, teenagers from Nepal, Bangladesh, Sri-Lanka, India, and Australia celebrated the day with small efforts towards social change. 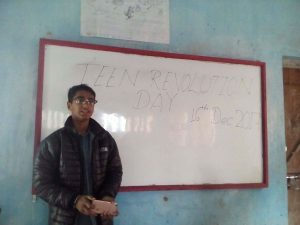 In Nepal, Teens who have been striving from a long time to create change in the society organized small program within their locality to motivate teenagers to create change and also to make society realize in Teen power to make a change. 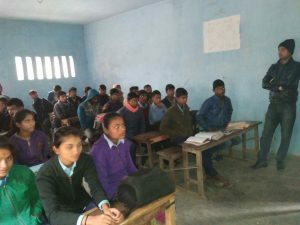 Different motivational sessions were conducted to motivate teens in these places approaching their skills enhancement to accommodate changes in their life through life skill education and to make them the responsible citizen of the country. 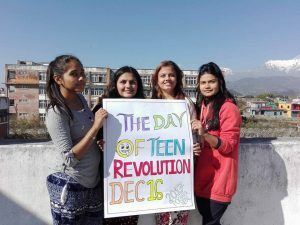 This year, Day of Teen Revolution in Nepal is marked from Pokhara, Nawalparasi, Sarlahi, and Kathmandu. 1) At Pokhara university, girls marked this day with the session on Teen Girl’s Empowerment and also focusing on menstrual taboos and reproductive health problems. These teen girls are really proud to be girl rather than setting themselves back in the society. 2) At Nawalparasi, Session was conducted on “Teen for Peace and Development” among 25 teenagers. The program highlighted the teen issues and made an individual pathway to face them and find the solutions from an individual level. 3) Ruby Moktan, one of Glocal’s 20 under 20 marked Day of Teen Revolution with her classmates sharing their journey and discussing teen problems and journey of Glocal’s 20 under 20 and inspiring them to utilize their skills in productive works and to create positive change in themselves and also in the society.